Emancipation of Minors-Can I do it without an attorney? Since writing a September, 2014 blog about emancipation of minors in Florida, my office has received many inquiries about this topic from both parents and teens. Very often the caller lacks the financial ability to pay for my law firm’s assistance with emancipation. This blog will provide some guidance for the person who wants to ask the court for emancipation of a minor without hiring an attorney. It’s not easy, but it can be done if you understand how to provide the court with the information needed to grant an emancipation petition. 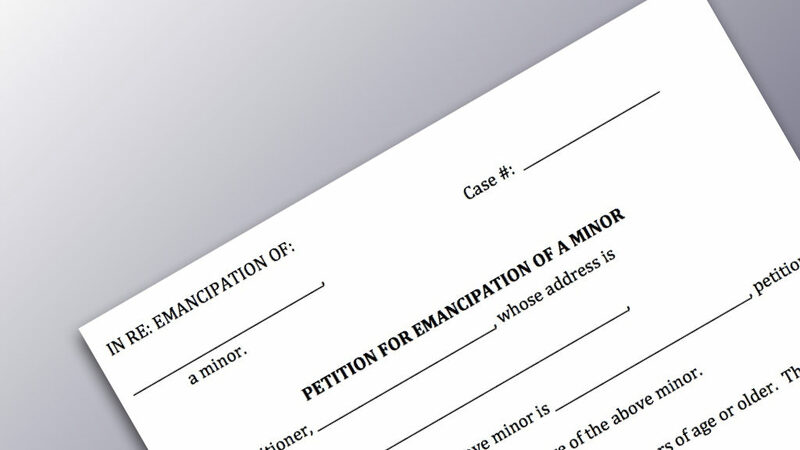 Keep in mind that a minor must be at least 16 years old to be eligible for emancipation. Whether or not a minor is granted emancipation is governed under s. 743.015, Fla. Stat. (2017), titled “Domestic Relations Disability of Nonage of Minors Removed”. A petition seeking emancipation must be filed with the circuit court disclosing all of the information required by the statute. The petition is not filed by the minor. It must be filed by at least one adult with legal responsibility for the minor, as described in the statute. A packet of forms for use in Florida’s Second Circuit Court provides a sample petition that can likely be used in any Florida circuit court. Other forms included in this sample packet may or may not be the forms required in other circuits as each circuit court has its own filing requirements. This information is usually available on each circuit court’s website or on the clerk of circuit court’s website for each Florida circuit court. If the petition is filed by the natural or legal guardian of the minor, the statute requires the court to appoint an attorney ad litem for the minor child to represent the minor in all related proceedings. The minor must also appear before the court to determine if the interest of the minor will be fully protected by emancipation. The petition should include a statement of “character, habits, income, and mental capacity for business, and an explanation of how the needs of the minor with respect to food, shelter, clothing, medical care, and other necessities will be met”. A statement explaining why the minor is seeking emancipation must also be included. The court must be made aware in the petition if the minor is a party to any court action taking place in Florida or another state. If only one natural parent of the minor files the petition, the other natural parent must be properly served with notice of the proceeding. If a guardian ad litem or next friend files the petition, proper service of process must be made on both natural parents. The court will consider whether it is in the minor’s best interests to emancipate the minor. In addition to disclosing all of the information required by the statute, the petition should include enough factual detail about the minor and his/her living circumstances to show that the minor’s best interests are served by emancipation. If the court agrees to emancipation, an order will be entered giving the minor the status of an adult for purposes of all civil and criminal state laws, and authorizing the emancipated minor to exercise all the rights and responsibilities of persons who are 18 years or older. The emancipation order should be recorded in the county where the emancipated minor lives. A certified copy of the judgment should be kept by the emancipated minor as proof of his or her emancipation. The Law Office of Jeanne Coleman offers only paid legal representation in emancipation proceedings. If you are filing an emancipation petition without legal representation, utilize online resources to guide you. Local legal aid organizations may be able to assist you if you meet their eligibility requirements.